So its harvest time in Ireland and most recipes I produce should be a celebration of new potato's etc. but with the miserable summer we have had and the low yields I felt this might be quite apt. More links, pictures etc as always on my garden blog, link in signature. This is a really nice traditional English dish. 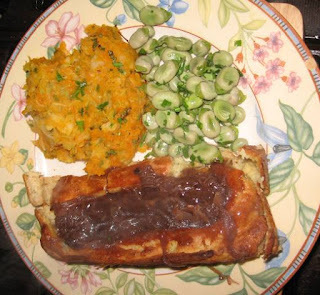 Toad in the Hole is normally served with mashed spud's and onion gravy. This is my Irish take on it - Frog in the Bog, or Loscann sa bPortach . I wanted to do something a little different from the normal mashed spuds. Besides, new potato's are not really suited to mashing. Colcannon, a mixture of milk, mashed potato and shredded cabbage is about as traditional as Irish food gets. 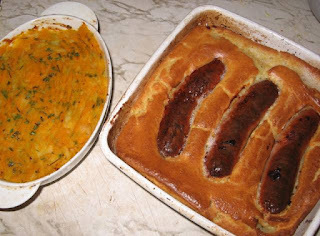 When the English cook toad in the hole, they tend to use herbed sausage like Cumberland, and if you wish to use them or other herbed bangers that's great. I just went for my favorite prize winning pork banger from McGeoughs in Oughterard as I use herbs in the buttermilk batter. I don't know if this would work with vegetarian sausages, if anyone does try please let me know how it went. Don't be afraid to play around with this, try turnips, suede's, carrots, parsnips and other root veg you might be growing or that are in season. Half a small head of white or green cabbage, very finely shredded - Blomendaalse Gele or greyhound are ideal. Good bunch of chives and parsley, finely chopped. Bring to a rolling boil, remove from the heat and set aside to infuse. Peel and dice to about 2" cubes the celeriac and gourd pumpkin. Place the celeriac in salted boiling water for around 10 minutes, then add the pumpkin. Cook for another 10 minutes or so until the roots are softening. Place the finely shredded cabbage in a metal sieve or steamer over the roots for about 5 minutes or until cooked - don't overcook. Strain the veg well and press excess liquid out of the cabbage - these veg retain more water than spuds and you don't want a soggy mash. Mix all the veg together and mash with a knob of butter, adding the herbed milk until you get the desired texture. You can do this while the root veg are cooking. Toad in the Hole is basically herbed sausage cooked in a Yorkshire pudding. I have gone about this in another way, giving the batter a lot more flavour and depth. As I have said before, I try to buy as much local produce and support local producers as much as possible, the closer the better. One of the reasons I started my garden was concern over food miles, and starting the blog was to look at Irish food in a different way - adapting home produce to expand a cuisine repertoire. So, on with the food. 2 or 3 teaspoons of very finely chopped rosemary, sage and thyme. As many good quality link sausage as you are going to use, the quantity above is enough for about 6, I just used 3. Pre-heat the oven to 200C/420F. Slip the cuinneog butter into a deep sided baking dish or tin with the sausages and place just this in the oven. Allow the sausages to brown on all sides, just give the baking tin the odd shake Do not prick the skins. While the bangers are browning off make up your batter. Crack the eggs into a mixing bowl and beat well. Add the chopped herbs, caraway seed and the buttermilk - water mixture, whisking it all together really well. Sift the the flour and baking powder into the bowl and season with a sprinkling of salt & pepper. Whisk the batter - what you want is a stiff but smooth batter with no lumps. Once the sausages are browned you can add the batter and herb mix. You want the cooking dish or tin quite hot with the fat and butter sizzling. Quickly arrange the Sausages, parallel to each other. Then pour in the batter mix while the oil is still sizzling. Place back into the oven and bake for around half an hour until the batter is puffed up, golden brown and crispy. Serve cut into squares with the root colcannon or mashed potato with a gravy of your own choosing. I did a quick wine and onion gravy and served with broad beans from the garden. The gravy was very simple, just 2 medium onions very finely sliced and a clove of garlic, sweated off with a knob of butter and some salt. Once they started to caramelise I added about 100ml red wine and 400 ml water with 3 teaspoons of Bisto gravy granules and left simmering while everything else was being prepped or cooked. The beans were shelled, I don't bother peeling them. They went into a small pot with about 200 ml of boiling water and a good knob of cuinneog butter for 5 minutes, strained off, another little bit of butter and herbs, tossed and served on the side. This meal only takes about 45 minutes, handy and very economical.